The uptake, transport, and presentation of Ags by lung dendritic cells (DCs) are central to the initiation of CD8 T cell responses against respiratory viruses. Although several studies have demonstrated a critical role of CD11blow/negCD103+ DCs for the initiation of cytotoxic T cell responses against the influenza virus, the underlying mechanisms for its potent ability to prime CD8 T cells remain poorly understood. Using a novel approach of fluorescent lipophilic dye-labeled influenza virus, we demonstrate that CD11blow/negCD103+ DCs are the dominant lung DC population transporting influenza virus to the posterior mediastinal lymph node as early as 20 h postinfection. By contrast, CD11bhighCD103neg DCs, although more efficient for taking up the virus within the lung, migrate poorly to the lymph node and remain in the lung to produce proinflammatory cytokines instead. 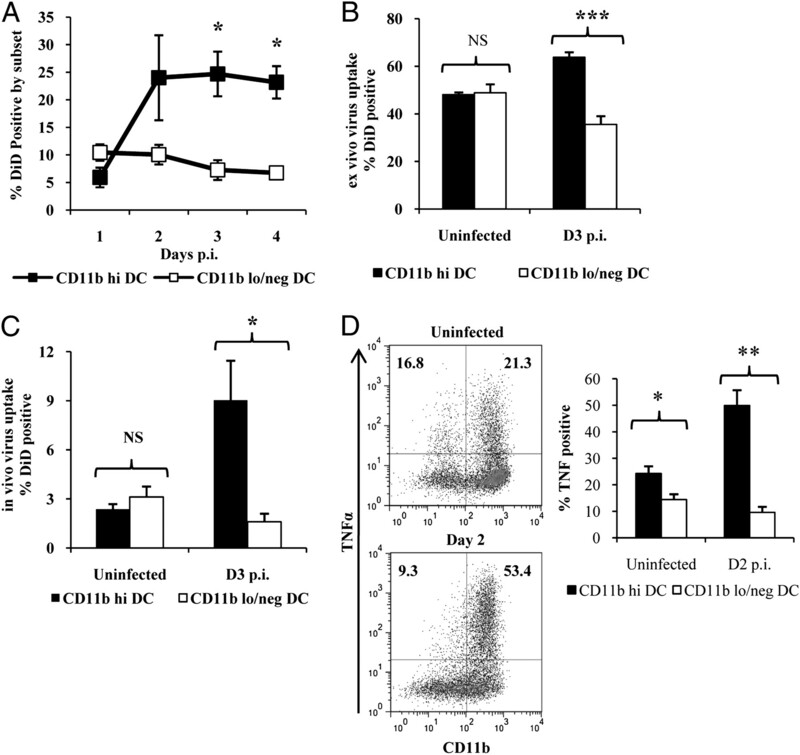 CD11blow/negCD103+ DCs efficiently load viral peptide onto MHC class I complexes and therefore uniquely possess the capacity to potently induce proliferation of naive CD8 T cells. In addition, the peptide transporters TAP1 and TAP2 are constitutively expressed at higher levels in CD11blow/negCD103+ DCs, providing, to our knowledge, the first evidence of a distinct regulation of the Ag-processing pathway in these cells. Collectively, these results show that CD11blow/negCD103+ DCs are functionally specialized for the transport of Ag from the lung to the lymph node and also for efficient processing and presentation of viral Ags to CD8 T cells. The establishment of a robust CD8 T cell response is a key factor in determining the outcome of an influenza infection. The absence of CD8 T cells results in delayed clearance of the influenza virus, elevated pulmonary viral titers, and increased mortality (1). Similarly, enhancement of CD8 T cell responses by adoptive transfer of virus-specific effector CD8 T cells is able to confer protection against lethal doses of influenza (2, 3), even in mice lacking B cells (4). CD8 T cells mediate viral clearance by initiating cytolysis of infected cells through FAS, perforin, and TRAIL, and the abrogation of any of these effector molecules results in the reduction of cytotoxic activity and delayed viral clearance (5, 6). Although the quality of CD8 T cell response in terms of effector function is crucial to viral clearance, the quantity of virus-specific cells generated is equally important in determining the outcome of infection. Tetramer staining of CD8 T cells reveals that there is a strong correlation between the number of virus-specific effector CD8 T cells in the lung and viral titer reduction (7, 8). Studies employing the adoptive transfer of effector CD8 T cells to demonstrate protection against lethal challenge typically inject 106–107 cells, and survival is correlated with the number of cells transferred in a dose-dependent manner (2, 3). This highlights the importance of generating sufficiently large numbers of effector CD8 T cell populations during influenza infection. Lung dendritic cells (DCs) are pivotal for the initiation of CD8 T cell expansion, and their depletion during or prior to infection dramatically attenuates virus-specific lung CD8 T cell responses and results in delayed viral clearance and higher viral loads (9, 10). The lung contains two major DC subsets that can be differentiated on the basis of CD11b and CD103 expression (11), both of which work in concert to generate optimal CD8 T cell responses (12, 13). 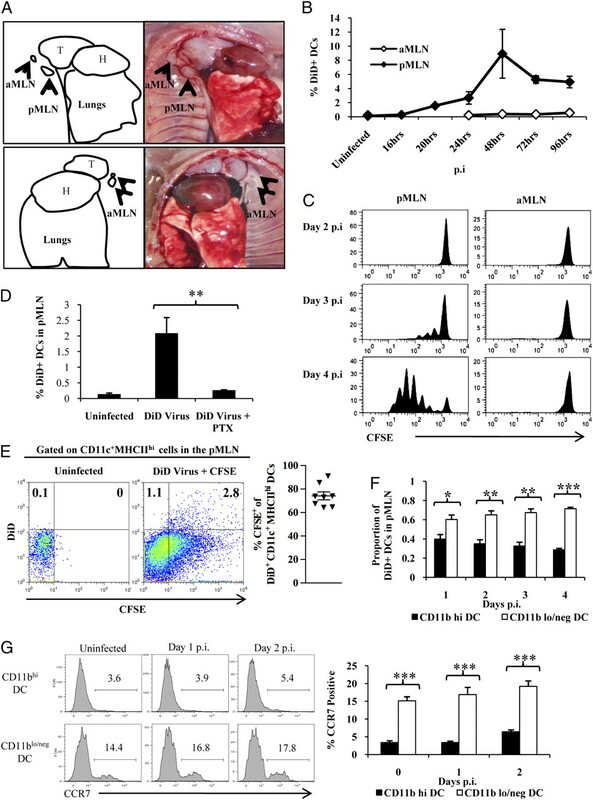 The trafficking of DCs carrying viral Ag from the lung to the lymph node (LN) is also a key step in initiating CD8 T cell responses, and CCR7−/− mice, which have impaired DC migration to LN, similarly exhibit poor CD8 T cell responses to influenza infection (14, 15). Although lung DCs are central to the CD8 T cell antiviral response, in particular the CD103+ DC subset (10, 15), key contributions of different DC populations to mediate viral uptake and migration to the draining LN remain poorly addressed owing to difficulties in the visualization of viral uptake in vivo. Furthermore, the key mechanisms underpinning the ability of CD103+ DCs to potently prime naive CD8 T cells during early infection have not been identified. To address these issues, we adopted a novel approach of labeling the lipid coat of influenza viruses with the fluorescent lipophilic dye, 1,1′-dioctadecyl-3,3,3′,3′,tetramethylindodicarbocyanine (DiD). Using the DiD label as a marker for viral Ag or the virus itself, we demonstrate that CD11blow/negCD103+ DCs are functionally specialized to mediate the efficient transport of influenza from the lung to the LN as early as 20 h postinfection (p.i.). By contrast, CD11bhighCD103neg DCs, although more efficient in taking up the virus, migrate poorly to the LN and remain in the lung to produce cytokines instead. We also confirm previous reports that CD11blow/negCD103+ DCs exclusively possess the capacity to potently induce proliferation of naive CD8 T cells and further demonstrate that this is due to its ability to efficiently load viral peptide onto MHC class I (MHC-I) complexes for presentation to CD8 T cells. Finally, to our knowledge, we show for the first time that CD11blow/negCD103+ DCs have higher constitutive expression of the peptide transporter TAP, which has a central role in peptide loading of MHC-I, providing important insights into the mechanism underlying the superior peptide-presenting ability of CD11blow/negCD103+ DCs. C57BL/6 and OT-I mice were obtained from Charles River Laboratories. BALB/c mice were obtained from Laboratory Animals Centre (Singapore), and clone 4 mice were purchased from The Jackson Laboratory (Bar Harbor, ME). All mice were maintained under specific pathogen-free conditions within National University of Singapore’s animal holding unit. C57BL/6 and BALB/c mice used were 6–8 wk old. OT-I and clone 4 mice used were 7–10 wk old. Intranasal challenge of mice with influenza was performed by injecting mice with ketamine (100 mg/kg) and medotomidine (15 mg/kg; both from Sigma-Aldrich) i.p. and administering 20 hemagglutinating units (HAU) of influenza in 20 μl volume. Atipamezole (5 mg/kg; Orion Pharma) was administered i.p. as reversal. Experiments with mice were carried out in accordance with the guidelines of the National Advisory Committee for Laboratory Animal Research, Singapore. Mice experiment protocols were approved by the Institutional Animal Care and Use Committee of the National University of Singapore. Influenza virus strain A/PR/8/34 (VR-95) was purchased from American Type Culture Collection. Recombinant influenza A/PR/8/34 containing the chicken OVA epitope SIINFEKL (PR8 OT-I) was a gift of P. Thomas (St. Jude Children’s Research Hospital, Memphis, TN). Viruses were either propagated in Madin–Darby canine kidney (MDCK) cells (ATCC CCL34) or 9-d-old embryonated chicken eggs from Bestar Laboratories. MDCK cells were maintained in DMEM with l-glutamine (Life Technologies, Invitrogen) supplemented with 10% FBS (HyClone, Thermo Scientific). For virus propagation, the media was changed to serum-free DMEM with 4 μg/ml L-1-tosylamido-2-phenylethyl chloromethyl ketone-treated trypsin (Pierce, Thermo Scientific) and incubated at 37°C with 5% CO2. The supernatant was harvested when cell lysis was widespread and passed through a 0.22-μm filter before concentration using 100,000 m.w. Vivaspin 20 centrifugal concentrators (Sartorius AG). DiD (Molecular Probes, Invitrogen) was dissolved in DMSO at a 25 mM concentration and used to label the concentrated influenza virus. Labeled virus was purified by ultracentrifugation using a sucrose step gradient. The interface containing the virus was harvested, and buffer exchange to PBS was performed using Zeba desalting columns (Pierce, Thermo Scientific). CFSE (Molecular Probes, Invitrogen) was dissolved in DMSO at a 0.1 M concentration. CFSE was diluted to 8 mM in PBS, and 20 μl was inoculated intransally into mice. After 10 min, mice were intranasally administered 20 HAU DiD-influenza in 20 μl PBS. Mice were sacrificed 24 h later, and the posterior mediastinal LN (pMLN) were removed for FACS analysis. Lyophilized pertussis toxin (PTX) from Bordetella pertussis (Calbiochem, Merck) was reconstituted to a concentration of 0.1 μg/ml, and 10 μl PTX was mixed with 10 μl 20 HAU DiD-influenza and intranasally administered into mice. Mice were sacrificed 24 h later, and the pMLN were removed for FACS analysis. Hemagglutination (HA) of guinea pig RBCs was performed by adding 50 μl 1% RBC solution to 50 μl 2-fold serially diluted DiD-influenza. The plate was incubated at room temperature for 2 h to determine the HA titer of the virus. For the plaque assay, serial 10-fold dilutions of the virus were allowed to adsorb onto confluent monolayers of MDCK cells on a 24-well plate for 1 h. The supernatant was then removed and replaced with 1% agarose supplemented with serum-free DMEM and 2 μg/ml L-1-tosylamido-2-phenylethyl chloromethyl ketone-treated trypsin. Plates were incubated for 3 d at 37°C with 5% CO2. Agarose overlay was then removed, and the plaques were visualized by addition of crystal violet. Influenza virus was irradiated with 240 mJ/cm2 UV light using a UV cross-linker (Spectroline). Lung parenchyma were excised, cut into small pieces, and digested in Liberase Blendzyme (Roche Diagnostics) for 45 min before physical disruption into single-cell suspension by passing through a 61-μm cell strainer (BD Pharmingen). DCs were enriched by density centrifugation using Optiprep (g = 1.064 g/ml; Axis-Shield). Where necessary, DCs were further enriched by positive selection with CD11c MACS beads (Miltenyi Biotec). BD Pharmingen anti-mouse Abs used for FACS analysis were CD4 PB (RM4-5), CD8 PB (53-6.7), CD11b allophycocyanin and PE (M1/70), CD11c FITC and PE (HL3), CD19 PE (1D3), CD80 FITC (16-10A1), CD86 FITC (GL1), and Ly-6G PE (1A8). Other Abs were eBioscience B220 allophycocyanin (RA3-6B2), Siglec H PE (eBio440c), I-A/I-E eFluor450 (M5/114.15.2), CD11c PerCPCy5.5 (N418), CD103 (2E7) PE and allophycocyanin, CCR7-biotin (4B12), Beckman Coulter CD11b PE-Cy7 (M1/70), Biolegend CD11c (N418), Alexa Fluor 647, Ly6C (HK1.4) Pacific Blue, TNF-α Alexa Fluor 488 (MP6-XT22), and Santa Cruz Biotechnology TAP1 (M-18) and TAP2 (M-20). TCR-like mAb against SIINFEKL-Kb (25-D1.16) was a gift of J. Yewdell and was biotinylated using EZ-Link Sulfo-NHS Biotinylation kit (Thermo Scientific). Anti-HA human mAb was generated, as described (16). Detection using secondary Ab was performed using anti-human IgG PE (Jackson ImmunoResearch Laboratories) and chicken anti-goat H+L Alexa Fluor 488 (Molecular Probes, Invitrogen). Intracellular staining of TNF-α in DCs was performed by restimulating lung CD11c+ cells isolated by MACS with 100 μg/ml poly(I:C) in the presence of Golgiplug containing brefeldin A (BD Pharmingen) and Golgistop containing monensin (BD Pharmingen) for 6 h. Cells were stained for surface markers and fixed with fixation/permeabilization buffer (eBioscience) before staining for intracellular TNF-α. For intracellular staining of HA, TAP1, and TAP2, cells were fixed and permeabilized using fixation/permeabilization buffer (Ebioscience) and stained using the primary Ab for 30 min, followed by secondary Ab for 30 min. All Ab staining was performed at 4°C, except for CCR7, which was performed at 37°C for 30 min, according to manufacturer’s recommendation. Secondary detection of CCR7 was done using streptavidin PE (Invitrogen) at 4°C for 30 min together with other Abs against cell surface Ags. Fc blocking Ab (2.4G2) was used during all FACS staining. Flow cytometric analysis was performed using CyAn ADP and analyzed using FlowJo software (Tree Star, San Carlos, CA). Cell sorting of lung DCs was performed using MoFlo (Beckman Coulter). CD11c+ lung cells were isolated using MACS beads cultured with DiD-influenza virus at a multiplicity of infection of 1 and incubated at 37°C for 40 min. Cells were washed twice before staining for FACS analysis. Single-cell suspensions from spleens and LN of mice were layered on Ficoll-Paque (GE Healthcare) and centrifuged at 600 × g for 20 min at room temperature. Cells accumulating at the interface were collected, washed, and isolated with anti-CD8α–conjugated MACS beads (Miltenyi Biotec). CD8 T cells were labeled with 5 μM of either CFSE or violet equivalent, violet CFSE (Molecular Probes, Invitrogen), according to manufacturer’s instructions. Labeled cells were washed twice and resuspended in PBS before i.v. injection into tail vein of BALB/c mice for clone 4 cells and C57BL/6 mice for OT-I cells. Approximately 2 × 106 cells were injected into each mice. DCs were stained for surface Ags without using PE-conjugated Abs and sorted using MoFlo. DCs were cultured on polylysine-coated slides for 45 min to adhere and fixed with acetone. Blocking was performed using Fc blocking Ab (2.4G2) and 1% BSA for 10 min. Tyramide signal amplification was performed using TSA Biotin System kit, according to manufacturer’s recommendation (Perkin-Elmer). Briefly, primary staining with biotinylated 25-D1.16 Ab was performed for 30 min, followed by streptavidin-HRP for 30 min. Biotinylated tyramide amplification was then performed for 8 min, followed by detection using streptavidin Dylight 546 (Jackson ImmunoResearch Laboratories). Slides were viewed under a fluorescent microscope, as described below. All slides were mounted in Prolong Gold Antifade Reagent (Molecular Probes, Invitrogen) and viewed using Carl Zeiss Axio imager.Z1 fluorescent microscope (Axiocam HRM camera; Carl Zeiss Micro Imaging). Images were processed using Axiovision Rel 4.8 software (Carl Zeiss Micro Imaging). Total RNA was obtained from sorted lung DCs using the RNeasy kit (Qiagen), following which cDNA was then obtained using QuantiTect Reverse Transcription kit (Qiagen). Both kits were used according to manufacturer’s instructions. Real-time PCR was performed on an ABI7500 real-time PCR system using SYBR Green (Applied Biosystems). Primers used for RT-PCR are as follows: TAP1 forward, 5′-GGAGGCCTTGGCTTACGTCGC-3′ and reverse, 5′-GGAGCCCACAGCCTTCTGCA-3′; TAP2 forward, 5′-CCGGACCTGCCTTTCCTCATAGC-3′ and reverse, 5′-CCGCAGGTTGATCCTGGACATGG-3′; TAPASIN forward, 5′-CCAGCACTCTCTTCAGCCTCTCC-3′ and reverse, 5′-CCACTGTTGCCATGGTGATGAC-3′. Data were analyzed for statistical significance using the unpaired Student t test. DiD-labeled influenza virus (DiD-influenza) provides a highly sensitive method to detect viral entry into cells (17). DiD-influenza could detect the uptake of both live and nonreplicating UV-irradiated virus into cells, whereas intracellular staining of hemagglutinin in the same cells only detected those that had taken up live and actively replicating viruses (Fig. 1A). DiD labeling of influenza did not compromise viral infectivity as both DiD-labeled and unlabeled virus induced similar levels of guinea pig RBC HA (Fig. 1B) and plaque formation in monolayers of MDCK cells (Fig. 1C). DiD-influenza was also infectious in vivo as mice infected with 20 HAU DiD-influenza exhibited pronounced weight loss by day 5 p.i. (Fig. 1D). DiD labeling allows the efficient detection of influenza virus entry and does not compromise infectivity. A, MDCK cells were infected overnight with either DiD-influenza or UV-irradiated DiD-influenza, followed by intracellular staining for HA. Numbers in the quadrants reflect the relative percentage. B, Comparison of serially diluted unlabeled and DiD-influenza to induce HA of guinea pig RBCs. C, Comparison of serially diluted unlabeled and DiD-influenza to form plaques on monolayers of MDCK cells. D, Morbidity of mice presented as a mean of percentage of original body weight ± SEM after intranasal infection with 20 HAU DiD-influenza (n = 10 for infected mice; n = 6 for uninfected mice). All data shown representative of two experiments. We next examined the distribution of DiD label within the lung of infected mice. DiD was mainly localized within the phagocytic leukocyte population comprising neutrophils, macrophages, and DCs (Fig. 2A), a likely result of uptake of cellular material from necrotic and apoptitic cells infected by DiD-influenza. We did not detect significant amounts of DiD label in T or B cells (Supplemental Fig. 1). As both DCs and macrophages in the lung express CD11c, we distinguished these two cell types by their side scatter profile and MHC class II (MHC-II) expression (Fig. 2B). 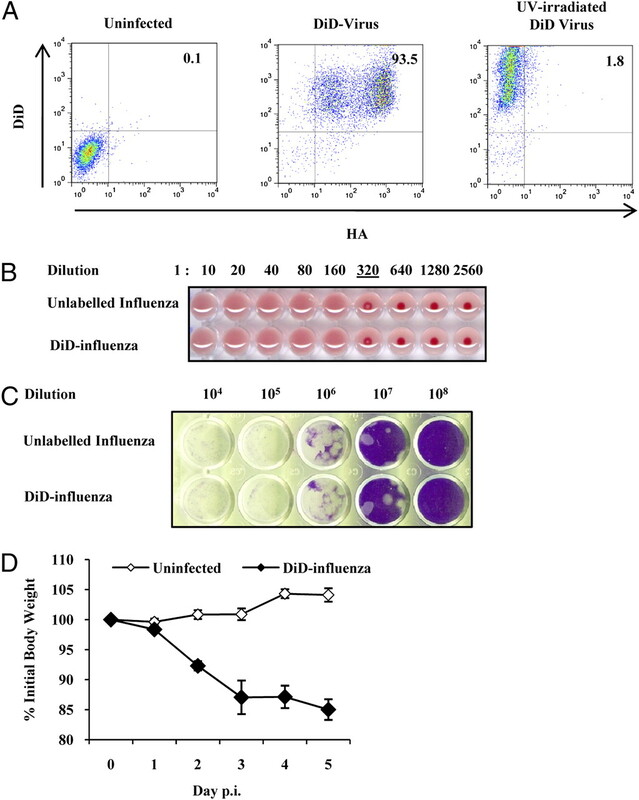 Infection with DiD-influenza also resulted in elevated expression of the costimulatory molecules CD80 and CD86 on both CD11blow/neg and CD11bhigh DCs collected from the lungs of DiD-influenza–infected mice (Fig. 2C). When segregated on the basis of DiD staining, DCs positive for DiD exhibited higher expression of both CD80 and CD86 compared with the DiD-negative population in both subsets, indicative of a more mature or activated state. A similar result was also observed when mice were inoculated with UV-irradiated virus, demonstrating that DiD is able to serve as a readout for the acquisition of viral Ag in vivo. DiD is a novel fluorescent tracer to monitor uptake of virus and viral Ag. A, Kinetics of DiD uptake by phagocytic cells in the lung over the course of infection. Graphs show pooled data from three experiments as mean ± SE of at least six mice for each time point. B, Gating strategy to define lung DC and macrophage populations. Numbers indicate the percentage of the gated cells within the dot plot. Macrophages were defined as side scatter high (gate G1) and CD11c+ MHC-IIlow/neg cells (G3). Purity of macrophages using the gating strategy is shown in G4. Lung DCs were defined as side scatter low (G2) and CD11c+MHC-IIhigh cells (G5) and consist of CD11bhighCD103neg and CD11blow/negCD103+ DCs. The lung DC gating strategy largely excluded B220+ Siglec H+ plasmacytoid DCs, as shown on the far right. FACS data representative of two experiments. C, Analysis of costimulatory molecule CD80 and CD86 expression on lung DCs before and p.i. with DiD-influenza. For infected mice, lung DCs were analyzed at day 2 p.i. (left panel). Enhanced expression of CD80 and CD86 when gating on DiD+ DCs compared with DiDneg DCs from DiD-influenza–infected mice at day 2 p.i. (middle panel). Same analysis of CD80 and CD86 in mice inoculated with UV-irradiated DiD-influenza at day 2 p.i. (right panel). FACS data representative of three experiments. Using DiD uptake as an indicator of Ag uptake, we next examined the relative ability of CD11bhigh and CD11blow/neg DCs to acquire DiD over the time course of influenza infection. At all time points examined, CD11blow/neg DCs exhibited stable uptake of DiD, whereas CD11bhigh DCs initially demonstrated a similarly low level of DiD uptake on day 1 that increased 6-fold by day 2 p.i. and remained elevated (Fig. 3A). We also compared the capacity of CD11bhigh and CD11blow/neg DCs to directly take up virus ex vivo as well as in vivo. Ex vivo uptake of DiD-influenza by CD11bhigh DC was enhanced compared with CD11blow/neg DCs from influenza-infected mice (Fig. 3B), indicating that CD11bhigh DCs indeed have an augmented capacity for virus uptake under conditions of infection. To validate this in vivo, we infected mice with unlabeled flu to establish an infection and subsequently inoculated the same mice with DiD-influenza at day 3 p.i. and removed the lungs 4 h later to compare uptake of the virus between the two DC subsets. Consistent with the ex vivo data, CD11bhigh DC were able to take up 5-fold more virus than CD11blow/neg DCs in vivo (Fig. 3C). In addition, CD11bhigh DCs also possessed greater potential to secrete TNF-α, an important antiviral cytokine (18). When restimulated ex vivo, >50% of CD11bhigh DCs from day 2 p.i. mice secreted TNF-α in comparison with only 9% of CD11blow/neg DCs (Fig. 3D). Lung DCs have differential viral Ag uptake and cytokine secretion capacities. A, Percentage of DCs in the lung that are DID+ over the course of influenza infection. B, Ex vivo viral uptake assay. CD11c+ lung cells were isolated using MACS beads from uninfected and mice infected with unlabeled influenza virus at day 3 p.i. and cultured for 40 min with DiD-influenza at a multiplicity of infection of 1. Lungs of three mice were pooled for each experiment. Graph shows mean + SE of pooled data from four independent experiments. C, In vivo viral uptake assay. Mice were first infected with 20 HAU unlabeled influenza virus to establish lung inflammation, and, at day 3 p.i., the same mice were intranasally inoculated with 20 HAU DiD-influenza and culled 4 h after to analyze relative uptake by DCs. Data pooled from three experiments and show mean + SE. n = 9 for uninfected mice and n = 7 for infected mice. D, Representative FACS plot of TNF-α intracellular staining in lung DCs from uninfected and day 2 p.i. mice after restimulation with 100 μg/ml poly(I:C) in the presence of brefeldin A and monensin for 6 h. Numbers reflect the relative percentage of TNF-α–positive CD11blow/neg and CD11bhigh DCs. Lungs of two to three mice were pooled for each experiment. Graph shows mean + SE of data pooled from four independent experiments. To determine the site where Ag presentation occurred, we tracked the migration of DCs using DiD and examined two prominent LN in close proximity to the lung, the anterior mediastinal LN (aMLN) and pMLN (Fig. 4A). DCs with DiD label could be detected in the pMLN as early as 20 h following infection, and, at the time points examined, DiD label was only detected in the DCs in the pMLN and not in the aMLN (Fig. 4B). To verify whether the pMLN was the site of Ag presentation, we adoptively transferred Ag-specific CFSE-labeled clone 4 CD8 T cells that recognize the epitope HA512–520 into BALB/c mice and infected them with unlabeled influenza. Proliferation of CD8 T cells was observed in the pMLN at days 3 and 4 p.i. and not in the aMLN (Fig. 4C), confirming that this was the site of Ag presentation. We repeated the experiment in C57BL/6 mice using a recombinant PR8 strain containing the OVA epitope SIINFEKL (PR8 OT-I) (19) together with OT-I CD8 T cells specific for SIINFEKL and similarly observed T cell priming in the pMLN (Supplemental Fig. 2A). To exclude the possibility of labeled virus leakage into the lymphatics, we administered PTX intranasally to inhibit lung DC migration (20). PTX is a potent G protein-coupled receptor inhibitor and has been demonstrated to efficiently inhibit DC migration by blocking chemokine receptor signaling. Intranasal administration of PTX in conjunction with DiD-influenza potently inhibited DC migration and was associated with the abrogation of DiD+ DCs within the LN. This demonstrates that DiD does not passively diffuse into LN where it is picked up by resident DCs, but that lung DCs take up the label in the lung and undergo activate migration (Fig. 4D). To confirm whether DiD could adequately track the migration of DCs from the lung, we inoculated mice with both DiD-influenza and CFSE, which had been previously used to track migration of DCs from the lung to the LN (21, 22). A large majority (75%) of DiD+ DCs in the draining LN were also CFSE+, demonstrating that DiD was able to serve as a marker to identify DCs that have acquired Ag in the lung and migrated to the draining LN (Fig. 4E). When DiD+ve DCs in the pMLN were divided into their subsets, CD11blow/neg DCs consistently formed the majority of DiD+ DCs across all time points examined (Fig. 4F), indicating an efficient uptake of Ag from the lung and migration to the draining LN. We went on to compare CCR7 expression on both DC subsets from the lung parenchyma as the migration of DCs from the lung to the draining LN has been demonstrated to be dependent on CCR7 (15, 23). We observed that CCR7 expression on CD11blow/neg DCs always remained substantially higher than CD11bhigh DCs, even though infection resulted in upregulation of CCR7 on both subsets (Fig. 4G). We also examined CCR7 expression on lung macrophages, and, as expected, no CCR7 expression was detected at all time points (Supplemental Fig. 2B). These results indicate that CD11blow/neg DCs are a highly migratory lung DC population that efficiently transports viral Ag obtained from the lung to the pMLN. CD11blow/neg lung DCs are highly efficient in transporting viral Ag to the pMLN. A, Photographs showing anatomical location of the aMLN and pMLN within the thoracic cavity. The aMLN are paired LN, located lateral to the thymus (arrows in black). The pMLN is a single LN diagonally below the anterior MLN, beside the esophagus (arrow in black). Only one aMLN is visible in the photo on the top as it is partially obstructed by the thymus. The letters H and T indicate the position of the heart and thymus, respectively. B, Percentage of DCs that are DiD+ in the pMLN and aMLN over the course of influenza infection. C, A total of 2 × 106 CFSE-labeled clone 4 CD8 T cells was i.v. transferred into BALB/c mice infected with unlabeled PR8 influenza virus on the same day. Mice were sacrificed at the indicated time points, and the aMLN and pMLN were harvested for analysis. Histograms are gated on CFSE+ CD8 T cells to exclude host CD8 T cells. n = at least 3 mice for each time point. D, 1 μg Bordetella PTX was simultaneously administered to mice with 20 HAU DiD-influenza. pMLN were harvested 24 h later and analyzed for the presence of DiD+ DCs. Data shown as mean + SE of four independent experiments. E, Representative FACS plot of DiD and CFSE staining of CD11c+ MHC-IIhigh DCs in the pMLN. Mice were intranasally inoculated with 25 μl 8 mM CFSE dissolved in PBS. Ten minutes later, mice were intranasally infected with 20 HAU DiD-influenza. Mice were culled 24 h later, and pMLN were harvested for analysis. Numbers indicate the percentage of cells in the respective quadrant. Percentage CFSE+ of DiD+ DCs was calculated by dividing the percentage of CFSE+DiD+ DCs by the total percentage of DiD+ DCs. Graph on the right shows the mean ± SE of data compiled from three experiments. Each triangle represents one mouse, n = 8. F, Proportion of DC subsets that comprise total DiD+ DCs in the pMLN. G, Representative FACS plot of CCR7 staining on DCs from the lung parenchyma from uninfected and infected mice at days 1 and 2 p.i. Graph on the right shows mean + SE of the percentage of lung DC subsets expressing CCR7 compiled from three experiments; n = at least 6 mice for each time point. * p < 0.05, ** p < 0.01, *** p < 0.001. As both lung CD11bhigh and CD11blow/neg DCs transported DiD to the pMLN, we tested the ability of these two DC populations to induce proliferation of naive CD8 T cells ex vivo. DCs were sorted from both the lung and pMLN of infected mice and cultured with freshly isolated virus-specific transgenic CD8 T cells. Consistent with previous reports (10, 21, 24), a strong induction of CD8 T cell proliferation was only observed when the CD8 T cells were cultured with CD11blow/neg DCs, but not with CD11bhigh DCs (Fig. 5A). We took care to exclude LN-resident DCs by gating on CD4/CD8neg DCs, as shown in Fig. 5A, as LN-resident CD8α+ DCs have been demonstrated to contribute to CD8 T cell priming as well (21) (Supplemental Fig. 3). CD11blow/neg DCs possess the requisite density of surface MHC–peptide complexes to initiate proliferation of naive CD8 T cells. A, CD11bhighCD103neg and CD11blow/negCD103+ DCs were sorted from the pMLN and lungs of influenza-infected BALB/c mice day 3 p.i. and cultured with naive CFSE-labeled clone 4 CD8 T cells at 1:10 ratio for 3 d. Data representative of three independent experiments. B, Rate of infection of DCs in the lung and pMLN as determined by positive staining of intracellular HA. DCs from the lung were obtained at day 2 p.i. and from the pMLN at day 3 p.i. and intracellularly stained for influenza HA. Graph shows mean + SE pooled from experiments; n = 6 for the lung and n = 7 for the pMLN. C, Expression of total MHC-I molecules, H-2Kb and H-2Db on CD11bhighCD103neg and CD11blow/neg DCs in the lung and pMLN from uninfected and day 2 p.i. mice. 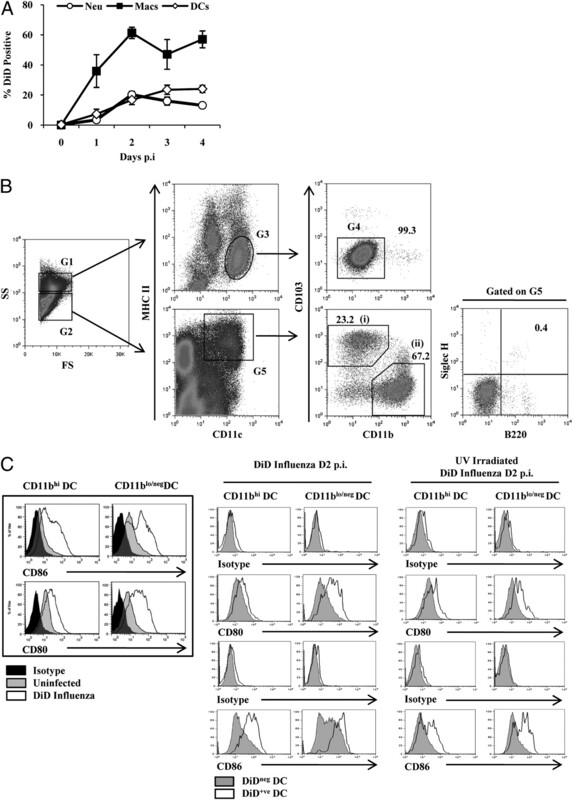 D, Proliferation of OT-I CD8 T cells when cultured with lung CD11bhigh and CD11blow/neg DCs pulsed with various concentrations of SIINFEKL peptide. Ratio of DC to CD8 T cell culture was 1:10. E, Representative immunofluorescence staining of SIINFEKL-Kb complexes on pMLN CD11bhigh and CD11blow/neg DCs from mice infected either with PR8-OT-I or PR8 influenza at day 3 p.i. Original magnification ×400. Scale bar, 20 μm. Relative percentages of SIINFEKL-Kb–positive DCs obtained by counting cells from high-powered fields over two experiments; n = 252 for CD11bhigh DCs, n = 575 for CD11blow/neg DCs. ***p < 0.001. This ability of CD11blow/neg DCs to potently mediate CD8 T cell priming could not be explained by the differential capacity of the DCs to be infected with the virus. Intracellular HA staining, which is indicative of viral replication, was detected at similar levels in both DC subsets from the lung (Fig. 5B), and yet CD11bhigh DCs manifested poor CD8 T cell priming potential, even when the ratio of DC to T cell culture was increased (Supplemental Fig. 4A). Thus, although we observed a greater percentage of HA+CD11blow/neg DCs in the pMLN (Fig. 5B), this could not sufficiently explain the differential capacity of the DCs to initiate proliferation of CD8 T cells. Both CD11bhigh and CD11blow/neg DCs also had similar expression of costimulatory molecules (Fig. 2B) or surface MHC-I molecules (Fig. 5C). Paradoxically, upregulation of MHC-I expression was more marked in CD11bhigh DCs from the lung, which nevertheless lacked potency in initiating CD8 proliferation. We hypothesized, therefore, that the inability of CD11bhigh DCs to stimulate CD8 T cells was due to insufficient presentation of viral peptide on MHC-I. Indeed, when both lung DCs were briefly pulsed with free peptide, both CD11blow/neg and CD11bhigh DCs demonstrated comparable ability to stimulate CD8 T cell proliferation across a wide range of peptide concentrations (Fig. 5D). To determine whether peptide–MHC concentrations were different in the DC subsets, we used a TCR-like mAb to detect SIINFEKL-Kb complexes on DCs isolated from the pMLN of mice infected with PR8 OT-I. As the number of SIINFEKL-Kb complexes on the DCs was below the limit of detection using standard flow cytometry techniques (data not shown), we sorted and cultured the DCs onto slides and used tyramide signal amplification to enhance sensitivity. SIINFEKL-Kb was detected on 37% of CD11blow/neg DCs, whereas only 3% of CD11bhigh DCs were positive using fluorescent microscopy (Fig. 5E), confirming that CD11blow/neg DCs were indeed superior at loading viral Ag onto MHC-I. Collectively, these results show that CD11blow/neg DCs are superior in priming CD8 T cells compared with CD11bhigh DCs as they possess the requisite density of surface MHC–peptide complexes to potently initiate proliferation of naive CD8 T cells. Having determined that CD11blow/neg DCs had higher amounts of viral peptide loaded onto MHC-I, we went on to compare mRNA transcript levels of proteins involved in the MHC class I loading pathway between the two DC subsets and observed significantly higher transcript levels of TAP1, TAP2, and TAPASIN in CD11blow/neg DCs (Fig. 6A). To determine whether the increased TAP1 and TAP2 mRNA transcripts in the CD11blow/neg DCs corresponded to higher protein expression of TAP1 and TAP2, intracellular staining of lung DCs using anti-TAP1 and anti-TAP2 Abs was performed on DCs isolated from both the lung and pMLN from uninfected and infected mice. We also further subdivided the CD11bhigh DCs from the lung parenchyma of infected mice into Ly6Clow/neg and Ly6Chigh subsets (12) (Fig. 6B). Consistent with the mRNA transcript levels, CD11blow/neg DCs constitutively exhibited higher TAP1 and TAP2 expression compared with all other DC subsets (Fig. 6C). Lung macrophages expressed low levels of TAP1 and TAP2 (Supplemental Fig. 4B) and accordingly exhibited poor CD8 T cell priming potential despite a high rate of Ag acquisition (Supplemental Figs. 1, 2A). Notably, DC expression of TAP1 and TAP2 was further enhanced in the pMLN compared with the lung, suggesting an enhanced Ag-processing capacity as DC mature and migrate to the draining LN. Interestingly, although infection resulted in increased DC expression of TAP1 and TAP2 in the pMLN, DCs in the lung displayed reduced TAP expression. This is likely the result of mature DCs migrating from the lung to the LN, giving rise to a predominantly immature DC population remaining in the lung. These results demonstrate that CD11blow/neg DCs have a distinct regulation of MHC class I loading pathway, and provides insight into the superior Ag-presenting ability of CD11blow/neg DCs. Collectively, our study demonstrates that CD11blow/neg DCs are functionally specialized for both the transport of Ag from the lung to the LN as well as for the efficient processing and presentation of viral Ags to CD8 T cells, and are therefore a crucial link between the host innate immunity and the adaptive CD8 T cell response. CD11blow/neg lung DCs have higher expression of TAP1 and TAP2. A, Relative mRNA transcript abundance of TAP1, TAP2, and TAPASIN in lung DCs sorted from uninfected C57BL/6 mice. Data representative of two experiments. B, Gating strategy showing subdivision of CD11bhigh lung DCs into Ly6Clow/neg and Ly6Chigh subsets. C, Intracellular staining of TAP1 and TAP2 in DCs from lung and pMLN from uninfected and day 2 p.i. mice. Numbers in the quadrant indicate mean fluorescent intensity of signal (1° + 2° Ab) after subtracting background (2° Ab only). Data representative of four experiments. Graph below shows the summary of compiled data. *p < 0.05, **p < 0.01, ***p < 0.001. The present study demonstrates the utility of fluorescent lipophilic dye-labeled influenza virus to visualize viral uptake in vivo. This approach is advantageous as only the lipid coat of the virus incorporates the dye, leaving the protein structure of the virus intact, therefore avoiding perturbations to viral binding, entry, and replication in host cells (Fig. 1B, 1C). One limitation of this method of labeling is that newly formed progeny virus will not carry the fluorescent label and thus underestimates the proportion of DCs that have acquired viral Ag. Nonetheless, DiD labeling circumvents the problematic issue of decreased viral infectivity and replication associated with insertion of GFP into the small influenza genome size of 14 kb (25–27), and is thus a convenient method to track the uptake of the virus by cells. There is a growing body of evidence suggesting that CD103+CD11blow/neg DCs are a highly specialized subset of nonlymphoid tissue DCs that form a vital link between the innate immune system and the adaptive cytotoxic T cell response. The data reported in this study are consistent with previous observations by other groups that CD11blow/neg DCs are highly efficient in priming CD8 T cells during influenza infection (10, 15, 21, 24). Although these studies show the dominance of CD11blow/neg DCs in mediating CD8 T cell priming during early infection, they fail to identify any mechanism for this observation. We demonstrate in this work that CD11blow/neg DCs migrate efficiently to the draining lymph to form the majority of DCs carrying flu Ag from the lung and are capable of inducing naive CD8 T cell expansion by virtue of efficient loading of viral peptide onto MHC-I complexes. Our data also suggest that one of the underlying mechanisms possibly responsible for the efficient presentation of viral Ag is a higher constitutive expression of the peptide transporter TAP in CD11blow/neg DCs. The role of CD11bhighCD103neg DCs in mediating CD8 T cell priming is not as unanimous, however. We as well as several others similarly observed that CD11bhigh DCs are unable to initiate CD8 T cell priming during influenza infection (10, 21, 24). A study by Kim and Braciale (15), in contrast, showed that CD11bhigh DCs could also potently prime naive CD8 T cells, albeit with 6-fold lower efficiency than CD11blow/neg DCs. An explanation for this difference is that the authors did not include markers such as CD8α to exclude LN-resident DCs when sorting DCs from the mediastinal LN. As a result, CD8α+ LN DCs capable of cross-priming CD8 T cells will inevitably be included into the sorted CD11bhigh lung DCs, resulting in the observation of naive CD8 T cell priming by these DCs. We confirmed this by performing LN DC-sorting experiments omitting CD8α and CD4 markers and found that we could observe significant proliferation of CD8 T cells with the sorted CD11bhigh DCs (Supplemental Fig. 3). Although CD11bhigh DCs do not have a significant contribution to the initiation of CD8 T cell proliferation during early infection, they play an essential role in orchestrating CD8 T cell responses during the late phase of infection by mediating the expansion of effector CD8 T cells (12), restimulating them for optimal cytotoxicity (9), and promoting their survival through CD70–CD27 interactions (13). It is also currently thought that CD11bhigh DCs have a role in priming CD4 T cells in the early phase of influenza infection, although there is an overlap of DC function here as CD11blow/neg DCs are also capable of performing this role (15, 28). Ag processing and presentation via the MHC class I pathway is an essential mechanism that is necessary both for the initiation of CD8 T cell responses by DCs as well as CD8 T cell-mediated recognition and killing of cells infected with the influenza virus. The heterodimer TAP1/TAP2 peptide transporter is a critical component of the MHC class I machinery in the endoplasmic reticulum and cis-Golgi (29) and is responsible for import of peptides derived from proteasomal degradation of cytosolic proteins. A defect in either component dramatically abrogates peptide loading of MHC-I, resulting in the destabilization of MHC-I complexes and, consequently, low surface MHC-I expression (30, 31). TAP1 and TAP2 expression have been associated with the ability of DCs as well as macrophages to cross-present exogenous Ags (32, 33). Furthermore, transduction of DCs to express elevated levels of TAP augments their ability to process Ag and results in increased display of viral peptides on surface MHC-I and a greater induction of virus-specific CD8 T cells (34). Within a normal physiological setting, there is also a correlation of TAP expression with the ability of DCs to prime CD8 T cells; splenic CD8α+ DCs that are efficient at mediating presentation to CD8 T cells exhibit higher expression of TAP molecules compared with all other DC subsets within the spleen (35). Consistent with this, our study demonstrates that lung CD11blow/neg DCs exhibit higher TAP expression, which correlates with their ability to present Ag to CD8 T cells. The cross-presentation of Ags by DCs during viral infections is a well-established feature (36), and this has also been documented for the influenza virus (21). However, it is currently not known to what extent cross-presentation of viral Ags by DCs contributes to the overall CD8 T cell response in vivo. This is due to the fact that DCs can also be directly infected by the virus and present cytosolic Ags derived from viral replication to CD8 T cells. Lung CD11blow/neg DCs are potent mediators of cross-presentation (23), and, by ex vivo analysis, our data suggest that cross-presentation by CD11blow/neg DCs may have a significant contribution in the priming of naive CD8 T cell during the early phase of infection. As shown in Fig. 5A as well as Supplemental Fig. 4, only CD11blow/neg DCs were able to potently stimulate proliferation of CD8 T cells, whereas CD11bhigh DCs poorly did so despite a similar rate of viral infection of both DCs in the lung parenchyma (Fig. 5B). A small degree of proliferation was observed with CD11bhigh DCs when the ratio of DCs to T cells was increased, suggesting that infected DCs also contribute to priming of CD8 T cells, but with much lower efficiency (Supplemental Fig. 4). This is most likely due to the low percentage of DCs infected by the virus. Cross-presentation of viral Ags by CD11blow/neg DCs may thus be a strategy of the host immune response to increase the number of DCs presenting influenza Ags to CD8 T cells. Vaccination strategies aiming to engender a protective CD8 T cell response against influenza have gained considerable interest in light of the recent H1N1 pandemic as CD8 T cells recognizing conserved epitopes can potentially provide protection against a wide spectrum of influenza strains. Of note, cross-reactive CD8 T cells recognizing epitopes from H5N1 and pandemic H1N1 2009 strains could be isolated from healthy individuals with no prior exposure to the virus (37, 38). Current vaccination strategies, however, are unable to elicit a potent CD8 T cell response (39). The targeted delivery of whole influenza virus to DCs may represent a viable strategy to enhance the development of cross-protective CD8 T cell responses while simultaneously inducing neutralizing Abs against the vaccinated strain. The use of fluorescent lipophilic dye-labeled influenza virus in this approach will enable tracking of virus delivery to DCs and, hence, will be a useful tool for the rapid evaluation and optimization of such rational vaccine designs. Our data identify that CD11blow/neg DCs are specialized for efficient transport of Ag from the lung to the LN and also for efficient processing and presentation of viral Ags to CD8 T cells, and thus represent a target of choice for vaccine strategies aimed at fostering robust CD8 T cell responses in the lung. We thank Benson Chua Yen Leong for excellent support in animal husbandry and Adrian Sim Chong Nyi and Anthony Tanoto Tan for helpful discussion and suggestions. This work was supported by grants from the Singapore Immunology Network (R182-000-148-305) and the National Medical Research Council, Singapore (R182-000-169-213) (to D.M.K.). 1992. Transgenic mice lacking class I major histocompatibility complex-restricted T cells have delayed viral clearance and increased mortality after influenza virus challenge. J. Exp. Med. 175: 1143–1145.
. 1999. Naive, effector, and memory CD8 T cells in protection against pulmonary influenza virus infection: homing properties rather than initial frequencies are crucial. J. Immunol. 163: 5535–5543.
. 2009. Tc17, a unique subset of CD8 T cells that can protect against lethal influenza challenge. J. Immunol. 182: 3469–3481.
. 1997. Resistance to and recovery from lethal influenza virus infection in B lymphocyte-deficient mice. J. Exp. Med. 186: 2063–2068.
. 1997. CD8+ T cells clear influenza virus by perforin or Fas-dependent processes. J. Immunol. 159: 5197–5200.
. 2008. CD8 T cells utilize TRAIL to control influenza virus infection. J. Immunol. 181: 4918–4925.
. 1999. In vivo proliferation of naive and memory influenza-specific CD8(+) T cells. Proc. Natl. Acad. Sci. USA 96: 8597–8602.
. 2005. Frequency, specificity, and sites of expansion of CD8+ T cells during primary pulmonary influenza virus infection. J. Immunol. 174: 5332–5340.
. 2008. Protective influenza-specific CD8 T cell responses require interactions with dendritic cells in the lungs. J. Exp. Med. 205: 1635–1646.
. 2008. 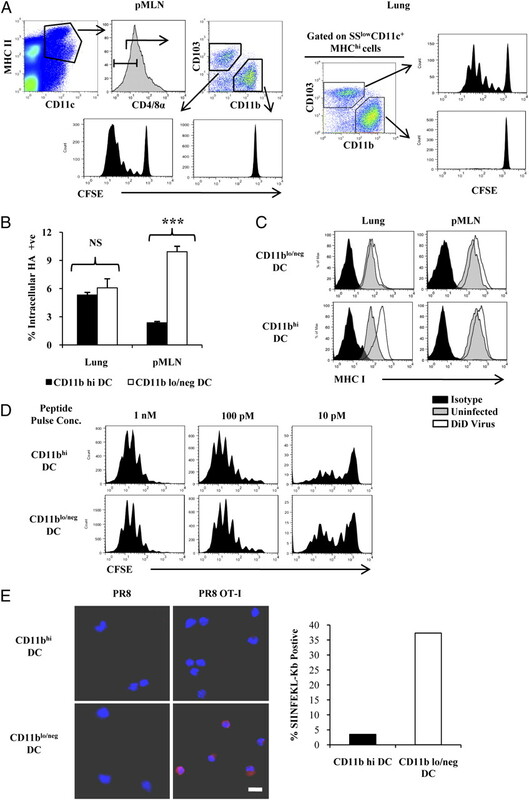 Clearance of influenza virus from the lung depends on migratory langerin+CD11b− but not plasmacytoid dendritic cells. J. Exp. Med. 205: 1621–1634.
. 2006. A major lung CD103 (alphaE)-beta7 integrin-positive epithelial dendritic cell population expressing Langerin and tight junction proteins. J. Immunol. 176: 2161–2172.
. 2009. TNF/iNOS-producing dendritic cells are the necessary evil of lethal influenza virus infection. Proc. Natl. Acad. Sci. USA 106: 5306–5311.
. 2010. Temporal changes in dendritic cell subsets, cross-priming and costimulation via CD70 control CD8(+) T cell responses to influenza. Nat. Immunol. 11: 216–224.
. 2008. CD4+ and CD8+ T cells exhibit differential requirements for CCR7-mediated antigen transport during influenza infection. J. Immunol. 181: 6984–6994.
. 2009. Respiratory dendritic cell subsets differ in their capacity to support the induction of virus-specific cytotoxic CD8+ T cell responses. PLoS One 4: e4204.
. 2008. Neutralizing human monoclonal antibody against H5N1 influenza HA selected from a Fab-phage display library. Virol. J. 5: 130.
. 2003. Visualizing infection of individual influenza viruses. Proc. Natl. Acad. Sci. USA 100: 9280–9285.
. 2002. Tumor necrosis factor alpha exerts powerful anti-influenza virus effects in lung epithelial cells. J. Virol. 76: 1071–1076.
. 2006. Addition of a prominent epitope affects influenza A virus-specific CD8+ T cell immunodominance hierarchies when antigen is limiting. J. Immunol. 177: 2917–2925.
. 2008. Optimization of methods to study pulmonary dendritic cell migration reveals distinct capacities of DC subsets to acquire soluble versus particulate antigen. J. Immunol. Methods 337: 121–131.
. 2004. Distinct migrating and nonmigrating dendritic cell populations are involved in MHC class I-restricted antigen presentation after lung infection with virus. Proc. Natl. Acad. Sci. USA 101: 8670–8675.
. 2003. Accelerated migration of respiratory dendritic cells to the regional lymph nodes is limited to the early phase of pulmonary infection. Immunity 18: 265–277.
. 2007. CD103− and CD103+ bronchial lymph node dendritic cells are specialized in presenting and cross-presenting innocuous antigen to CD4+ and CD8+ T cells. J. Immunol. 178: 6861–6866.
. 2007. Minimal activation of memory CD8+ T cell by tissue-derived dendritic cells favors the stimulation of naive CD8+ T cells. Nat. Immunol. 8: 1060–1066.
. 2004. Rescue of influenza virus expressing GFP from the NS1 reading frame. Virology 324: 67–73.
. 2004. Characterization of a neuraminidase-deficient influenza A virus as a potential gene delivery vector and a live vaccine. J. Virol. 78: 3083–3088.
. 2010. Analysis of in vivo dynamics of influenza virus infection in mice using a GFP reporter virus. Proc. Natl. Acad. Sci. USA 107: 11531–11536.
. 2008. Division of labor between dendritic cell subsets of the lung. Mucosal Immunol. 1: 442–450.
. 1992. Location of MHC-encoded transporters in the endoplasmic reticulum and cis-Golgi. Nature 357: 342–344.
. 1992. TAP1 mutant mice are deficient in antigen presentation, surface class I molecules, and CD4−8+ T cells. Cell 71: 1205–1214.
. 1992. Major histocompatibility complex (MHC)-encoded HAM2 is necessary for antigenic peptide loading onto class I MHC molecules. J. Biol. Chem. 267: 11669–11672.
. 2003. Tapasin−/− and TAP1−/− macrophages are deficient in vacuolar alternate class I MHC (MHC-I) processing due to decreased MHC-I stability at phagolysosomal pH. J. Immunol. 170: 5825–5833.
. 2008. Combining the antigen processing components TAP and Tapasin elicits enhanced tumor-free survival. Clin. Cancer Res. 14: 1494–1501.
. 2005. Using the TAP component of the antigen-processing machinery as a molecular adjuvant. PLoS Pathog. 1: e36.
. 2007. Differential antigen processing by dendritic cell subsets in vivo. Science 315: 107–111.
. 2001. Cross-presentation in viral immunity and self-tolerance. Nat. Rev. Immunol. 1: 126–134.
. 2008. Memory T cells established by seasonal human influenza A infection cross-react with avian influenza A (H5N1) in healthy individuals. J. Clin. Invest. 118: 3478–3490.
. 2010. Memory CD4 T cells direct protective responses to influenza virus in the lungs through helper-independent mechanisms. J. Virol. 84: 9217–9226.
. 2009. Prospects for an influenza vaccine that induces cross-protective cytotoxic T lymphocytes. Immunol. Cell Biol. 87: 300–308.